[Monday, May 2, 2005] Spacehab today announced that it has consummated the sale and lease back of its 58,000 square-foot processing facility in Cape Canaveral, Florida in a transaction with Tamir Silvers LLC valued at $4.8 million. [Monday, May 2, 2005] Boeing and Lockheed Martin have entered into an agreement to create a joint venture that will combine the production, engineering, test and launch operations associated with U.S. government launches of Boeing Delta and Lockheed Martin Atlas rockets. [Monday, May 2, 2005] Space Exploration Technologies Corporation has been awarded a $100 million IDIQ contract by the U.S. Air Force/Space and Missile Systems Center (SMC Detachment 12) for Responsive Small Spacelift (RSS) launch services. [Tuesday, May 3, 2005] "Attached to this synopsis are the draft Statement of Work and the draft Data Requirements Documents list for this contract." [Wednesday, May 4, 2005] Nordic Satellite AB (NSAB) announced today that the launch of its SIRIUS 4 satellite will be on a Proton Breeze M booster provided by International Launch Services (ILS). Terms of the contract remain confidential. [Wednesday, May 4, 2005] Phoenix will be landing on the icy northern pole of Mars in May of 2008.� It is believed that the ice-rich soil there may be one of the few habitable environments where a biological system can survive. [Wednesday, May 4, 2005] NASA TV's digital conversion from a single analog channel to multiple digital streams is slated for early to mid-May. The current analog signal will be provided through the end of June to allow for a smooth transition. [Wednesday, May 4, 2005] Boeing marked the official opening of its new Space Launch Complex 6 (SLC-6) facility April 27 at a dedication ceremony held at Vandenberg Air Force Base (VAFB), Calif.
[Thursday, May 5, 2005] Regenetech works with NASA under its license and Reimbursable Space Act Agreement. The firm uses the patented IntrifugeTM system process to dramatically multiply adult stem cells to a far greater degree than has been demonstrated previously. [Thursday, May 5, 2005] Boeing announced Monday that the launch of the first of three next-generation Geostationary Operational Environmental Satellites for NOAA and NASA aboard a Delta IV rocket has been rescheduled for June 23, with a launch window extending to June 25. [Thursday, May 5, 2005] The Inmarsat-4 F1 satellite has successfully completed in-orbit tests following its launch on 11th March 2005. Early orbit operations have progressed as planned, and all spacecraft functions are performing well. [Friday, May 6, 2005] "Please do not wear these in our facilities and keep your eyes open for others that do not get this message. A Quality Alert has been issued at our Wasatch Facilities due to the serious nature of what silicone can do to our processes." [Friday, May 6, 2005] "As a critical component of the Agency replanning effort, I have initiated an Exploration Systems Architecture Study. The study team will begin immediately and must complete its activities by mid-July to support a number of key Agency decisions." [Monday, May 9, 2005] NASA announced selection today of Computer Sciences Corporation (CSC) of Falls Church, Va., as the prime contractor to support the NASA Shared Services Center (NSSC). [Monday, May 9, 2005] Canadian Arrow has successfully tested their main engine designed to produce the thrust required for liftoff of the rocket. The test, conducted on May 5th, is the latest in a series completed on the rocket engine for the Canadian Arrow launch vehicle. [Wednesday, May 11, 2005] NASA has selected Northrop Grumman Information Technology, Falls Church, Va., and Titan Corporation, Reston, Va. for the Independent Verification and Validation (IV&V) of Software Services. [Thursday, May 19, 2005] "This proposal would prohibit obtrusive space advertising and make other minor changes to the regulations governing commercial space transportation. The proposed changes are necessary to reflect a statutory change, capture current practice ..."
[Thursday, May 19, 2005] David L. Emerson, Minister of Industry and Minister responsible for the Canadian Space Agency, today announced an investment of $20.4 million in 44 research and development contracts. 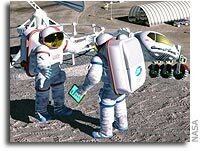 [Friday, May 20, 2005] The MoonROx (Moon Regolith Oxygen) challenge will award $250,000 to the first team that can extract breathable oxygen from simulated lunar soil before the prize expires on June 1, 2008. [Saturday, May 21, 2005] Mr Pedreira was selected 2nd May 2005, on a competitive basis out of a large number of highly qualified candidates. He will head the European GNSS Supervisory Authority, which is a new Community Agency, for a 5 year term which can be renewed. [Saturday, May 21, 2005] A Boeing Delta II rocket successfully launched the latest satellite for the National Oceanic and Atmospheric Administration (NOAA) today. [Monday, May 23, 2005] A Russian Proton Breeze M launcher placed the DIRECTV 8 satellite into orbit today, marking the fourth successful mission of the year for International Launch Services (ILS). [Monday, May 23, 2005] NASA/JSC plans to issue a Request for Proposal (RFP) for the transition of a portion of the International Space Station (ISS) Payload Integration activities from the ISS Payload Integration Contract (IPIC), NAS 9-02099 (which ends on September 30, 2005). [Monday, May 23, 2005] The Government is currently conducting a trade study to determine the quantity and type of pressure suits that may be required to meet the requirements of the VSE. [Wednesday, May 25, 2005] Spacehab has entered into a non-reimbursable Space Act Agreement with NASA to facilitate the commercial development and testing of a micro-miniature mass spectrometer for potential use on low earth orbit missions and in NASA's Exploration program. [Thursday, May 26, 2005] NASA TV is moving forward with its July 1 plans to convert from a single analog NTSC channel to four channels of Standard Definition MPEG-2 digital video, including a dedicated Media Services channel. [Friday, May 27, 2005] "The existing NASA and the NASA Web Portal contractor will handle the integration of the selected sponsor(s) in-kind solution. NASA is seeking an Agreement that will take effect July 1, 2005, and last through December 31, 2005." [Friday, May 27, 2005] A new era in global meteorological forecasting begins today with the launch of the first of five EADS Astrium state-of-the-art microwave humidity sounder (MHS) instruments on board the US polar orbiting satellite NOAA-N.
[Friday, May 27, 2005] Orbital Sciences Corporation today stated that U.S. government agents executed search warrants yesterday at its Dulles, VA and Chandler, AZ facilities. Orbital stated that company officials are fully cooperating with the investigative authorities. [Saturday, May 28, 2005] SpaceX conducted a successfull test firing of its Falcon 1 rocket on Friday at Vandenberg Air Force Base. While the engines were running for only 5 seconds - this milestone represented a big step for the new rocket maker none the less. [Monday, May 30, 2005] NASA plans to issue a Request for Proposal (RFP)] for the NASA 2005 Small Business Innovation Research Program. The NASA SBIR program is conducted under the authority of the Small Business Innovation Research Program Reauthorization Act of 2000. [Monday, May 30, 2005] NASA/GRC plans to issue a Request for Proposals for the 2005 NASA Small Business Technology Transfer Program. The NASA STTR program is conducted under the authority of the Small Business Technology Transfer Program Reauthorization Act of 2001. [Tuesday, May 31, 2005] "According to previous studies and our discussions with industry representatives, these challenges would likely preclude using alternative vehicles for ISS assembly missions."